The ex-chairwoman of the official pro-Brexit campaign has sidestepped calls to apologise after the group dropped its appeal over a spending fine. The Electoral Commission fined Vote Leave £61,000 after ruling it exceeded spending limits during the referendum. 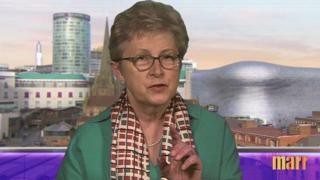 Asked by the BBC if she would say sorry, Gisela Stuart instead defended the organisation's record. The watchdog had said: "Serious offences such as these undermine public confidence in our system." Vote Leave - which was fronted by Boris Johnson and Michael Gove - was fined in July for spending more than the £7m spending limit. But on Friday - the day MPs voted on Theresa May's withdrawal agreement - the campaign dropped its appeal, saying it had run out of money to pursue the case. When asked on the Andrew Marr Show if she would apologise, the former Labour MP replied: "At every stage we were rule-compliant according to the legal advice we were given at the time. "Our biggest problem was that we destroyed all our data and therefore some of the evidential basis people were asking for." She said laws governing spending - and the way they are interpreted by watchdogs such as the Electoral Commission - "needed rewriting". She also argued that the Remain side of the campaign spent more money than the Leave side anyway. According to the Electoral Commission, the Remain campaign spent £19,309,588 and the Leave campaign spent £13,332,569 on the EU referendum. The Vote Leave campaign was found to have funnelled £675,315 through pro-Brexit youth group BeLeave, days before the referendum in 2016. This helped ensure it did not breach the £7m spending limit. Vote Leave bosses say they were given the go-ahead to give the money to BeLeave and they acted within the rules. But the commission found there was "significant evidence of joint working" between Mr Grimes and Vote Leave, and Vote Leave should have declared the spending as its own. On Friday, an Electoral Commission spokesman said: "Vote Leave has today withdrawn its appeal and related proceedings against the Electoral Commission's finding of multiple offences under electoral law. "Serious offences such as these undermine public confidence in our system and it is vital they are properly investigated and sanctioned. "We look forward to receiving the sum in full."